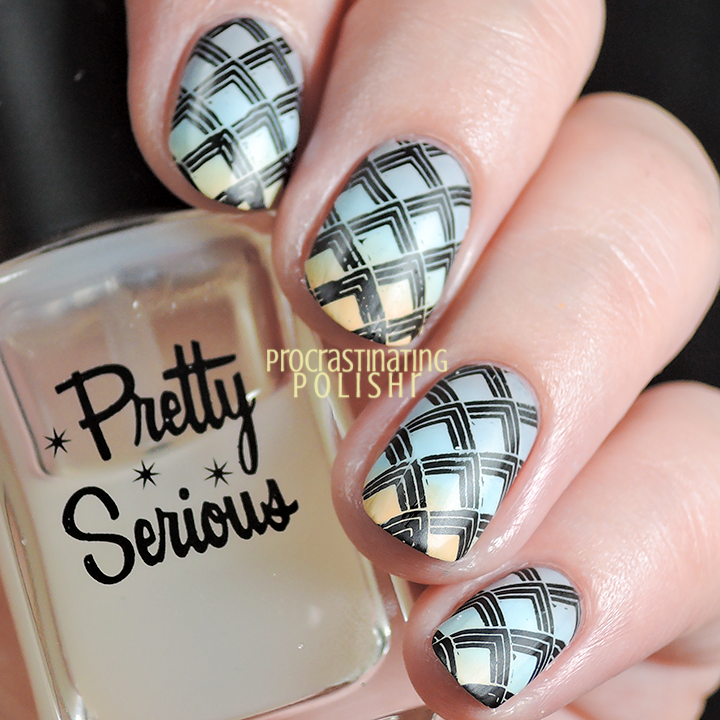 Paint All The Nails presents Pastel Geometric! Pop the champagne, it's Paint All The Nails time! You might know by now, but every month me and some fabulous blogger pals linkup with a group voted theme - it's always so much fun to see how differently we all interpret the theme! I was pretty excited by the choice this month because geometric is totally my jam! Pastel is less my thing, but I made it work for me by pairing it with black. I think I'm on a kick with this Bundle Monster x Lucy's Stash plate, this is the second time you're seeing it used here this week! It's such a great mix of designs, and it's designed by the fabulous Lucie so you really can't go wrong. I did a stamped gradient over my favourite black, Pretty Serious Absence. While it looked ok glossy I had to add some matte top coat which definitely took it to another level! If you want to check out how to gradient stamp I highly recommend this easy to follow tutorial by Very Emily - it's much easier than you might think. I don't know about you but I can't wait to see what the rest of the group did - check it out below! Disclosure: ^This post contains affiliate links which may yield commissions for procrastinatingpolishr.com - refer to my Disclosure page for more information. Lucky St Patrick's Day Nail Art! Stamping with Hehe 056 - Nail Art + Review!